Here are 4 Plan-It planners very generously sent to me by Paul Alford, CEO of the Student Media Group. The Student Media Group makes student planners for more than 60 universities across the US. SMG advertises local businesses, such as restaurants and services, in the planners. This has the double benefit of creating an excellent resource for students of what is available in town, and also allows the planners to be given out to students for free with purchase at their university bookstore. The planners themselves are excellent. Purely from a planner point of view, the formats and layouts are great. And, the university planners are packed with local information which makes them even more useful. 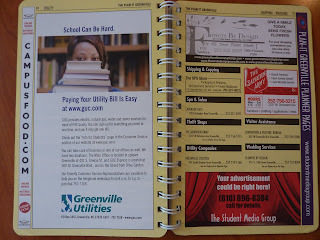 Most exciting to me is that in the back of the planners, there is a Yellow Pages section with tons of information on local businesses! Having this reference right in your planner is so handy, because you can have it with you everywhere you go for access whenever you need it. More on the Yellow Pages later. Let me walk you through the university planners. 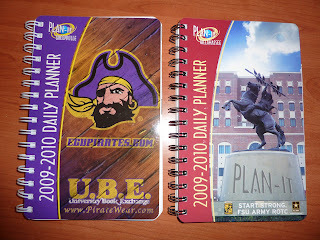 In the photo below, on the left is the planner for this school year at East Carolina University in Greenville. On the cover there is a picture of their pirate mascot and two great websites listed: www.ecupirates.com which is the university's official athletic site, and www.piratewear.com which, wow, has every possible kind of logo items you could ever dream of. 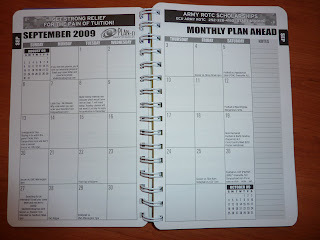 On the right is this school year's planner for Florida State University, Tallahassee. There's a really nice photo on the cover. Each planner has the academic schedules listed which is really nice to be able to see when exams are, when's homecoming, when there will be no classes, etc. 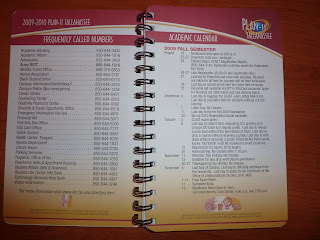 Also in each planner there is a list of frequently called numbers at the university. I'm guessing that some universities probably have more information in the planners than others. I would really like to see a page of useful websites for the university that includes information on campus housing policies and dining halls, the health center, academic resources, advising, special programs for studying abroad, the campus life center, etc. That way students can have easy access to that information. Something else I would really like to see in all the university planners is a map of campus, because that is definitely something you need when you are walking around, especially at the larger schools. Even after 4 years at my university, I still needed to refer to a map sometimes to find some buildings. A very useful feature in any academic planner: your class schedule. At the end of the semester you can also record your final grades on the page to have as a reference. It's amazing how quickly I forgot which semester I took which classes, and what grade I got in each! The planners themselves are outstanding. Take a look at this monthly page because it has a lot of really excellent features. Click on the photo to enlarge and really get a good look. First of all, I am adamant that every weekly planner should have monthly planning pages, so it's great to see this feature in these planners. The layout is excellent, with squares large enough to write in and a Notes column at the side for those reminders of what is coming up that month, totals, or whatever else. Each monthly page also has the calendar for last month (top left corner) and next month (bottom right corner) for reference. Sports events, holidays/ no classes, important university dates like registration or drop/add are noted right on the dates they happen. This is extremely useful information that students otherwise might not know about right away. 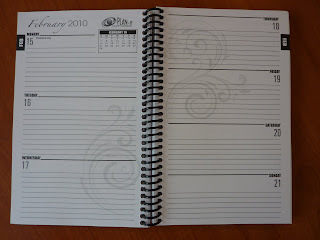 These monthly calendars are placed at the beginning of each month throughout the weekly planning pages. 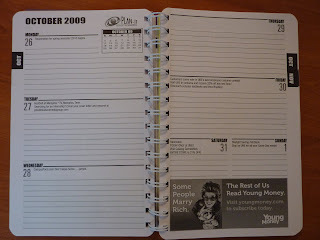 And to help you find each month, there are black squares running down the edge of the page with the month abbreviation. I haven't described it very well, but look at the photo below to see what I mean: This is another feature that I wish every planner in the world had! It really helps when you're flipping through the planner to find a particular month. The tabs easily direct you to each month's planning pages. Below is the weekly layout. This is an excellent format, with plenty of room each day to write assignments and plans. Each weekly page has the current month's calendar for reference (yet another feature I wish every planner had!). The daily spaces have information like sports events, registration etc. It even tells you when to change your clocks for Daylight Savings Time, and gives you a heads-up on sales at the university bookstore! 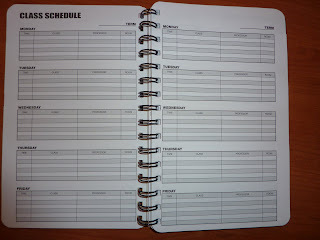 The planners themselves are an excellent size: 5 1/2 inches wide by 8 1/4 inches tall. I think this is an ideal size for a weekly planner, because it gives you plenty of room to write and yet is still very portable to fit into your backpack or tote. The spiral bound book lays flat on its own, which is very important for any planner so that you can hold the phone with one hand and write at the same time. The book also folds back on itself easily for those times when you need it to take up less space, like on a crowded desktop. 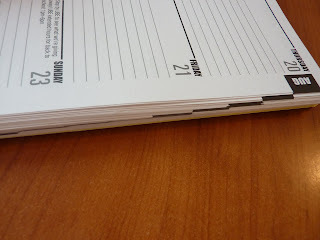 I didn't take a picture of it, but in the middle of the planner at the beginning of the spring semester there is a plastic divider. This is a great reference point to divide the first semester from the second semester, and also helps strengthen the book. I also didn't take a photo of the Sudoku puzzles in the back of the planner, for those times when you're commuting to campus on the bus or bored in class (not that you would EVER not pay attention in class. Of course! I'm just sayin'.). In the back of each of the university planners there are several pages with numbers for restaurants and take-out (some with menus! ), apartments near campus, salons, doctors, dentists, car services, lawyers, and more. This is especially useful since most people have cell phones today. Wherever you are, you can just look up the number, call, and you're on your way! There are also several money-saving coupons in the back of the planner, which is great. Because as we all know, any money you can save while you're in college means more beer. I mean books! Yes! Books are expensive. Ehem. 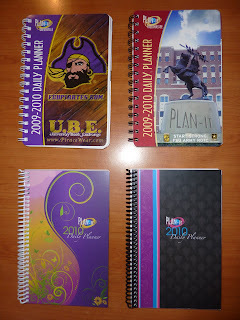 The university planners have rounded corners, sturdy double-wire binding, and thick laminated covers so they are likely to survive an entire school year of being shoved into bags, banged around, and having coffee spilled on them. I really like how the university planners get the students right into the culture of their school. Just reading through the planners I feel included in the university culture. I think this is especially important for Freshman and incoming transfer students. And it's a great way to let students know dates of important campus events. 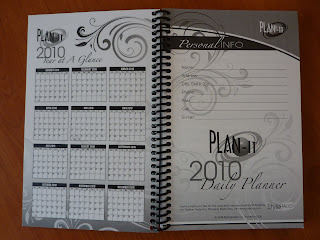 I have used planners similar to this when I was in undergrad and grad school, and I have also seen other university planners, and the Plan-It planners really stand out from the crowd. The whole vibe of the planners is very friendly and helpful. I have seen some university planners that treat the students like they are in jr. high rather than adults out on their own. The Plan-It planners definitely don't do that. They are fun and informative. You can look through the entire book online! 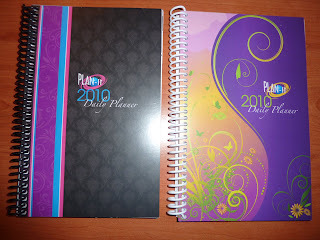 These planners are for the 2010 calendar year (January-December). They have pretty covers and are spiral-bound with squared corners. Each monthly layout has all those features I love including the Notes column, last and next months' calendars, holidays and notable dates. They also have the same excellent weekly format as the university planners, with this month's calendar for reference and plenty of space to write each day. Also there is a pretty swirly pattern on the pages which is nice to look at. And, there are the monthly tabs running down the side of the page. I love that feature! In the back of the planner there are a couple of pages for contacts and notes. Inside the back cover there is an annual calendar for next year (another feature every planner should have!!) and an easy-reference page for frequently called numbers. 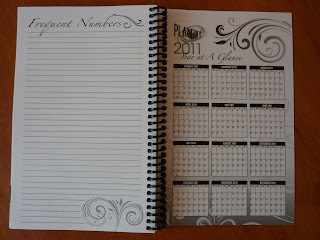 It's an excellent planner with outstanding features and formats, and a pretty design. 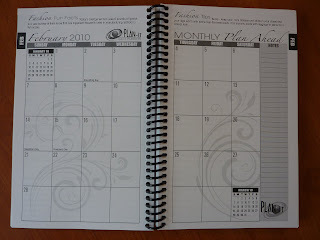 The Fashion Planners are available on eBay, seller planitplanners. Beyond the features, there's just something about these planners that I really like. They have a happy, positive vibe to them. Some planners stress me out. Some are too freaking serious. Some are silly or frivolous. But these planners are highly functional while being fun and friendly at the same time. Especially the university planners are like having a good friend on campus who can tell you all the important stuff, show you around to all the fun stuff, and give you the inside scoop on life on campus. Also in my next post: an interview with Paul Alford, CEO of the Student Media Group! 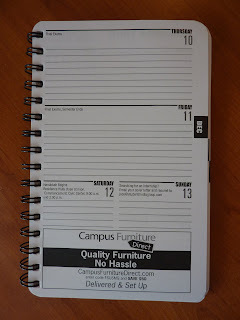 You can find more information about the planners and the company at www.StudentMediaGroup.com. You can also find them on Facebook (follow this link) or by searching on Facebook for Student Media Group. 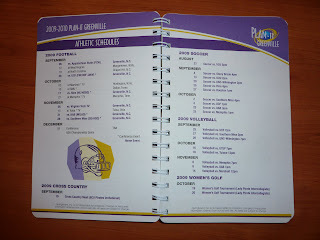 After reading this enormously long post, seeing the photos, and looking through the East Carolina planner online, can anyone else come up with any suggestions for Paul about the planners? He really welcomes feedback and is always looking for ways to improve his products. So if you have an opinion, please post it in the comments! Thanks! Sara that is a great idea!